Launched in the UK at the beginning of 2005, RESTYLANE® Vital is a new NASHA gel manufactured by Q-Med (now part of Galderma), the maker of the popular RESTYLANE®, dermal fillers; aimed at a whole new approach to skin rejuvenation. The recommended injection technique is the micro-puncture technique that involves injecting very small amounts of RESTYLANE® Vital into the deep dermis, about 1- 2cm apart. Once injected, the NASHA gel flows smoothly and distributes evenly in the skin. A new product just targeted at the lip area called RESTYLANE® Lip Refresh also joined the RESTYLANE® Skinboosters family, but has since been discontinued. Non-Animal Stabilized Hyaluronic Acid (NASHA) gel. What do Restylane Skinboosters contain? RESTYLANE® Skinboosters are made from Q-Med’s patented NASHA gel, with no extra additives. They also come with or without 0.3% lidocaine as a local anaesthetic. How is Restylane® Vital made? Is a skin test required before Restylane® Skinbooster treatment? Is Restylane® Vital temporary or permanent? 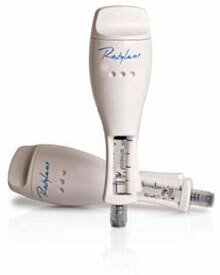 Restylane® Skinboosters should be used by trained members of the medical profession only. RESTYLANE® Vital (20mg/ml of HA) is available in a pre-filled syringe of 1ml NASHA-gel, and each pack includes three needles, for greater patient injection comfort. It is administered using a 30G needle and can be delivered via a pen-style injector. It is targeted at more mature skin with sun damage. It is available with or without 0.3% lidocaine (local anaesthetic). In late 2008, Q-Med launched a less-concentrated, finer particle version of RESTYLANE® Vital called RESTYLANE® Vital Light (12mg/ml of HA). It can be used for the same treatment as RESTYLANE® Vital but the manufacturer is recommending the use of the product as a preventative treatment for skin that it still in good condition, i.e. younger patients, as well as those with more delicate skin. The product is available in a pack with a pre-filled 1ml syringe with three 30G needles or it can be delivered via a pen-style injector (no longer available). It is available with or without 0.3% lidocaine (local anaesthetic). Each disposable pen injector came preloaded with 2mls of product and also included three needles. It required manual winding by the practitioner before its trigger mechanism could be used to release a precise amount of product (10 µl) into the skin, meaning uniform injection and results. The last product to join the RESTYLANE® Skinboosters family was RESTYLANE® Lip Refresh. This product is targeted at lip hydration rather than volume augmentation, to restore smoothness and some fullness to dry lips. The product is available in a pack with a pre-filled 1ml syringe and is only available with the addition of 0.3% lidocaine (local anaesthetic) to avoid discomfort from injecting the lips. A single treatment is usually all that is required with this product, not a programme of repeat hydration sessions. This has now been discontinued. New branding in 2016, means that Restylane SkinBoosters now come packaged like this. RESTYLANE® Skinboosters should not be used in or near areas where there is active skin disease, inflammation or related conditions. They should not be injected into an area where a permanent implant has been placed. This depends upon your age and lifestyle as well as the correct placement of the product by a practitioner. Generally, two to three treatments every fourth week are recommended initially, followed with maintenance treatments approximately every four to six months for Vital and Vital Light. RESTYLANE® Lip Refresh results are expected to last for up to 6 months. After the injection of RESTYLANE® Vital, some common injection related reactions might occur. These reactions include transient erythema (redness), swelling, pain, itching, discolouration or tenderness at the injection site. Typically resolution is spontaneous, within one or two days after injection into the skin. Additionally, temporary palpable lumpiness has been noted after injection in some patients. Localised reactions thought to be of a hypersensitivity nature have been reported in about 1 in every 10,000 treated patients. These have consisted of swelling at the injection. Redness, tenderness and rarely acneform papules may occur. The reactions have started either shortly after injection or after a delay of 2-4 weeks and have generally been described as mild to moderate and self-limiting, with an average duration of 2 weeks. In addition, rare cases (less than I in 15,000 treatments) of granuloma formation, superficial necrosis and urticaria have been reported. This depends on the area treated and how much is required, and the practitioner doing the treatment, but price ranges are in the region of £175 per 1ml syringe of RESTYLANE® Vital or £500 for a course of three treatments, typically lasting up to 30 minutes. RESTYLANE® Vital Light is approximately £250 per 2ml syringe or £700 for a course of three treatments. RESTYLANE® Lip Refresh will cost £250 - £300 per syringe which is enough for both lips. Images provided courtesy of Q-med Limited and Fiona & Marie Aesthetics at LPSA. All before and after photographs are real patients, your results may differ). Click for ALL Restylane ® Skinboosters (Vital & Vital Light) clinics in the UK & Ireland registered and verified by Consulting Room.